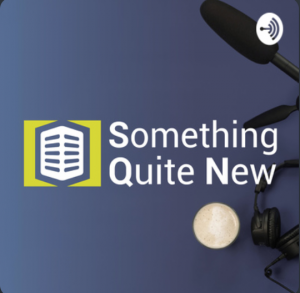 It’s not every day you get to let something “quite new” out into the world, but we have done just that by launching our first-ever podcast, Something Quite New (can you see what we did there?). Over the last couple of years, podcasting has taken off in a big mainstream way. As it was with YouTube, enabling anyone to become a video creator, the same has happened in audio as podcast production has become easier and cheaper. At the same time it has become simple to listen to episodes wherever you are; in your car, on your phone or on your Google Home or Amazon Echo. It’s a time when technology has suddenly opened up a whole new world of opportunity. No matter your interest you can find a podcast to suit you. Enjoy hearing celebrities interviewing each other? Then David Tennant, George Ezra and even Alec Baldwin are giving it a go. If you’d rather listen to Formula 1, football, Brexit, personal development or educational podcasts, there is always something for you to find. Personal favourites include: WTF with Marc Maron, Conan O’Brien Needs a Friend, Lineker & Baker: Behind Closed Doors and Hip Hop Saved My Life with Romesh Ranganathan – to name just a few! So, what about this small show we have brought into the world? Our aim is provide people interested in the worlds of sport and technology a better handle on the latest trends, news and developments from within the industry…and find out what others are doing in this age of constant change. To do this, we will be interviewing a variety of guests and publishing them on a fortnightly basis. They’ll be a variety of industry experts from the world of sport and technology, all helping us to learn Something Quite New!